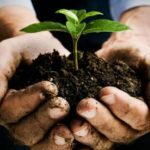 Soil health is the capacity of the soil to function as a living system, with ecosystem and land use boundaries, to sustain plant and animal productivity, maintain or enhance water and air quality, and promote plant and animal health. Soil health is especially important to ensure long-term productivity of farming operations as well as ecosystem health. Only “living” things can have health, so viewing soil as a living ecosystem reflects a fundamental shift in the way we care for our soils. Soil isn’t an inert growing medium, but rather it is teaming with billions of bacteria, fungi, and other microbes that are the foundation of an elegant symbiotic ecosystem. Soil is an ecosystem that can be managed using soil health principles and best management practices. Click on each box to learn more about soil health concepts.